In “One Day in the Life of Anton Baklanov,” Gabriel asked Philip if he was falling apart. But Philip isn’t the only one in danger of emotional collapse. Elizabeth has never been more vulnerable than she is right now. While that might make things more dangerous in the world of espionage, it makes them so much better in the world of television. We’re finally getting to see through the cracks in Elizabeth’s dutiful façade, and Russell has done such a brilliant job of subtly, carefully showing these intense emotions and how they impact a character who has been taught for her entire life that emotions get in the way of doing your duty to your country. Russell’s performance in this episode was absolutely heartbreaking. The Americans has done such a wonderful job this season of telling a story about mothers and daughters, and Russell is at the emotional center of that story. The moments when she finally told Paige about her own mother were so emotional because Russell played them with such warmth. You could feel Elizabeth’s deep love for both her mother and her daughter, and Russell conveyed such a palpable sense of relief, too. All Elizabeth wanted was to connect with her daughter—for her daughter to love her for exactly who she is, imperfections and all, the way she loves her own mother. And she saw this as her chance. That made it even more devastating to see her entire spirit crumble when Paige rejected her. It’s a rare thing for Elizabeth to be the emotionally open one in a given scene, and Russell always infuses those moments with a kind of tentative, quiet beauty that makes you want to hug this ruthless Russian spy and never let her go. Nothing in Elizabeth’s life is going according to plan, and it’s breaking the heart she never wanted to expose in the first place. That idea extended to her encounter with the hotel manager. It was a fascinating way to show Elizabeth being faced with the “making it real” concept Philip first talked about in “Salang Pass” and how that affected her. For what seemed like the first time, Elizabeth couldn’t just fake it; she had to let herself get to a real place with her mark in order to sexually please him, and I loved that the show and Russell allowed us to see how deeply shaken Elizabeth was by it. The scene in the garage after she came home from the encounter was one of my favorite scenes Russell has ever done on this show. With just her eyes and her breathing, she was able to make me cry because I felt Elizabeth’s exhaustion, shame, and pain so acutely. What impressed me the most about that scene was the complexity Russell was able to portray without using any words. It’s one thing to convey a single emotion in silence; it’s another to silently bring to life the overwhelming whirlpool of emotions a character would feel after a night like Elizabeth had. Elizabeth felt shame from being aroused by a man who wasn’t her husband; pain from having to give up control over her body once again for her cause; and sadness from knowing Paige will have to hear about (and maybe even experience) this part of the job someday. Elizabeth has never appeared more human, and that moment of emotional nakedness was followed by the incredibly symbolic scene of her taking all her clothes off before getting into bed with Philip. The sexual act that happened after wasn’t about Philip—and he knew it. It was about Elizabeth and the million emotions she was working through. To be able to portray a character feeling so many things so deeply while still not letting herself give into them completely is as difficult an acting challenge as it gets. But Russell has proven herself to be worthy of every challenge thrown her way. 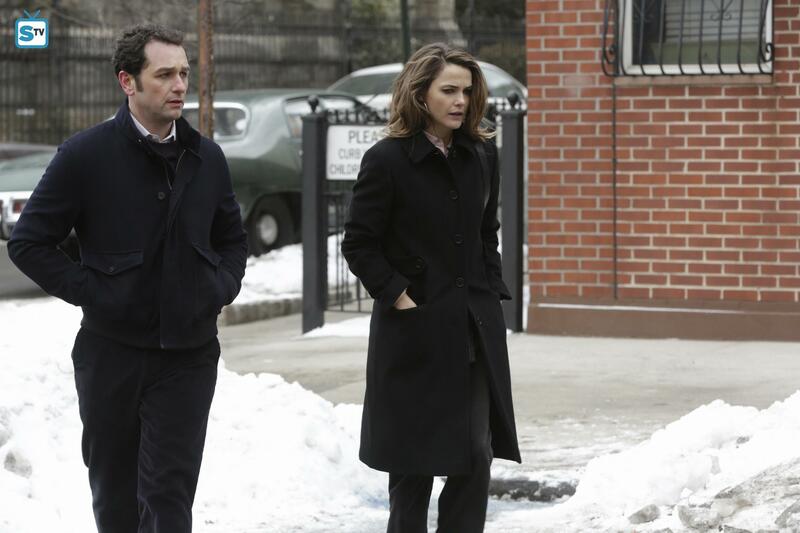 The Americans is a show about parents and children, but sometimes it’s hard to remember that every parent is someone’s child, too. That idea was at the heart of Elizabeth and Paige’s talk in the car. It broke my heart to know that Elizabeth was lying to Paige about always wanting her and Henry—because we know from flashbacks that Elizabeth didn’t want to have children but chose to have Paige because Philip was ready for the baby she knew they’d need to have eventually. That opening lie was used in such a great way to put the viewer in Paige’s shoes, trying to figure out what’s real and what’s not. However, Russell showed through the honesty of her performance that Elizabeth was trying to be open with Paige about her past in the way she’s wanted to be for so long. Since the beginning of the season, it’s been clear that all Elizabeth wants is to be understood and accepted by the family she’s grown to love. Having Paige learn the truth was the way she believed she would finally be able to connect with her daughter. But it’s been devastating to see that all the truth has done is push her daughter farther away. Elizabeth might finally be able to be open with Paige about who she really is, but Paige is under no obligation to accept her for who she really is. It was beautiful to hear Elizabeth open up about her mother, and I loved the genuinely proud way she said Paige has her grandmother’s spirit. And on a different show, Paige might have softened more in the face of her mother’s openness—but not on The Americans. On this show, Paige acted the way a real young woman would if she was still dealing with being lied to for her whole life. She listened to her mother’s story; she never interrupted her or told her to stop. But, in the end, she didn’t accept her with open arms and an open heart. She just calmly asked how she could ever believe anything Elizabeth tells her, which was the most painfully realistic reaction they could have written. Kudos to Holly Taylor for playing that moment with such maturity. She’s become a solid scene partner for Russell, and I am eagerly anticipating watching this relationship develop and shift with every scene these two characters (and two actors) share. • For an episode named after Anton Baklanov, I actually found his scenes to be the least interesting in the episode. I know the payoff is going to come for Nina’s storyline, but there are times when it does feel too removed from the main action to maintain the sense of urgency I feel from almost every other storyline unfolding this season. • There was lot going on in this episode, but everything except the Nina stuff (and the nice comedic relief—and possible foreshadowing that beeps will be important—with Oleg and Tatiana) added up to the same thing: Philip and Elizabeth are under a lot of strain; they’re being asked to handle so much, and any one of their many missions has the potential to backfire at any moment. From Martha’s interrogation to Lisa’s husband seeing through Elizabeth, I’m not sure I’ve ever felt more worried for Elizabeth and Philip than I do right now. • Henry’s Eddie Murphy impressions seem to be a running joke now, and that makes me smile because humor is always welcome on this show. • I loved how genuinely concerned Philip was about Elizabeth sleeping with the hotel manager. It could have come across as over-protectiveness or even jealousy, but last week we saw both Elizabeth and Philip hoping a woman would take the next shift, allowing Philip to take the seducer role. Elizabeth hasn’t had to do this kind of work in a while—notably, not since her breakdown after the “Clark” incident last season—and I thought it was nice to see Philip looking out for her emotional state as she was about to enter a situation he seems to know she’d rather avoid. • The way The Americans deals with the emotional repercussions of “sexpionage” never fails to impress me. I was so moved by everything Elizabeth went through in this episode, and I loved that none of it—from her facial expressions in the car to Philip’s in bed—was simple or easy to decipher. • The “morning after” scene between Philip and Elizabeth was another beautiful example of the chemistry between Russell and Matthew Rhys. Both actors were able to say so many things to each other while only actually saying “Hi.” There was an intimacy in that moment that was even more profound than what was shown in the scene that took place the night before. And it was another vulnerable moment for Elizabeth in an episode brimming with them. • This episode was tied together by the theme of finding safe spaces. For Anton and Nina, they find safety in using English. For the FBI, there’s the vault. And for the Jennings Family, it’s the car. That’s where Philip and Elizabeth can talk about missions, where Paige and Elizabeth can talk about her past, and where Elizabeth can let her emotions out after sleeping with the hotel manager. And at the end of the episode, Paige entered the ultimately symbol of a private space for a husband and wife—the bedroom. It was fitting that she shut the door to end the episode, leaving Philip and Elizabeth in a space that’s safe for them but still doesn’t feel that way for her. • Does anyone have any ideas for how Philip is planning to get Elizabeth to see her mother? The first thought that came to mind to get Elizabeth to see her Mom is that they would find a way to tie it into the mission Paige was going to take with her Church. But her mother seems a bit too ill to be able to transfer her somewhere, so that theory isnt completely worked out yet!